What do we want to have in a Skill Tree? Project Arkadia Forum › Development › Design › What do we want to have in a Skill Tree? Back when the game was still being developed as an Arma mod, we had a discussion about skilltrees. talked about the possibility of having a skill tree, that players can spec into. that all be skill based? Crafting, researching, survival skills maybe? Discuss below, and let us know what you want from a skill-tree? I would use a skill tree where you can level your skills. I made a little skill overview here. I don't really know how to visualize it so i have no picture. I made a picture in my next post! I really like the idea that you have to level up to different tiers to unlock special abilities, rather than getting something new every time you level up a skill. Horse riding could be a part of the "Survival Essentials", as we are planning to have that in early on. (01-14-2018, 10:38 AM)Stephano Wrote: I really like the idea that you have to level up to different tiers to unlock special abilities, rather than getting something new every time you level up a skill. Horse riding could be a part of the "Survival Essentials", as we are planning to have that in early on. Thanks! I have more ideas for some skills but it is very difficult to visualize and balance it. Also, I added the horse riding to the Survival Essentials skill. I'll probably add more skill ideas in the next days. 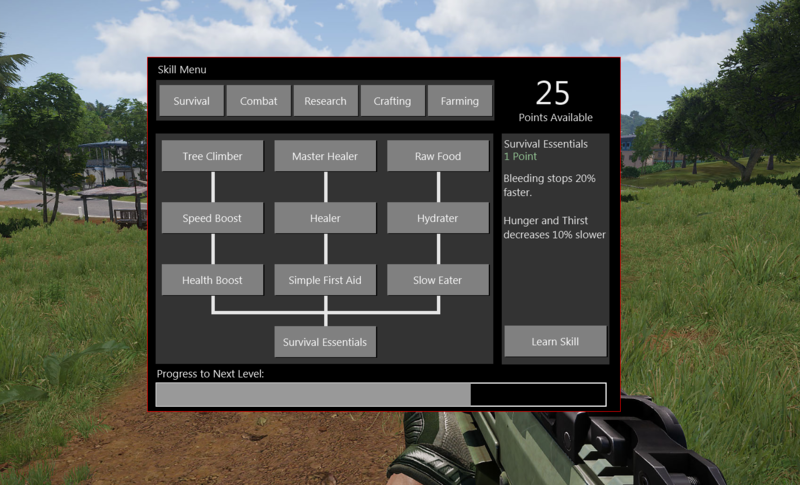 EDIT: Just finished a skill menu image. The icon for the Heavy Rifles is a bit misleading. Heavy Rfiles are snipers, not necessarily miniguns. Also I don't know how the player is going to level his skills. Either they are leveled passiv while performed skill related actions or the player gets skill points with each player level-up. I would prefer the first option. I dont think there should be a level requirement to be able to pick up and use sword or any other weapon.I think a skill level similar to Mount and Blade would fit a lot better. For example anyone could use a basic knife and a basic hunting bow. But players could invest points into a specific skill such as archery which would allow them to pick up stronger bows such as a great bow. Or invest points into Blades which would allow them to use a heavy sword. Maybe invest points into Guns and the player could use different attachments or use heavier more powerfull weapons.